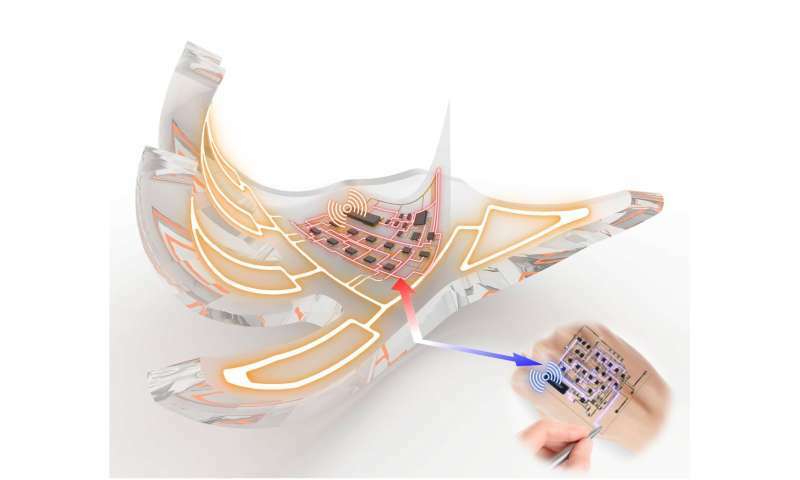 They developed an electronic skin (e-skin) pair as a two-part, wireless soft driving system based on fully printable, stretchable hybrid electronics. One part is the e-skin for input sensing at a human side, and the other for activating soft robots. The e-skins are soft (same material for the target robot body), thin (<1 mm), and lightweight (~0.8 g) and also feature the spatially fragmented circuit configuration with a slew of miniature IC components (standard dimension, <1.5 mm × 1.5 mm). Therefore, they can be stretched and conformed onto the dynamic surface like human skin or soft robots. The electronic functionality of this system is based on wireless inter-skin communication. 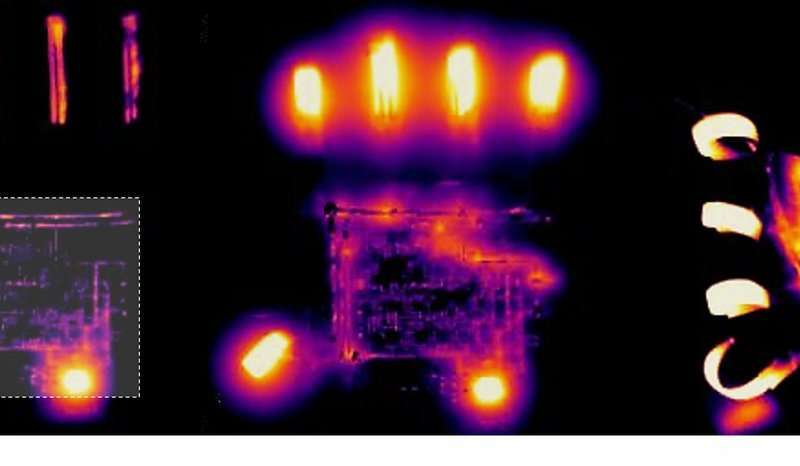 The e-skin pair can perform wireless communication of the four-state control signal at a distance of more than 5 m, and the embedded encoding mechanism makes the inter-skin communication noise-tolerant. The proposed e-skins can be softly, compactly, and reversibly assembled into soft robot frames to activate muscle-like soft actuators without interfering with their soft motions. Benefits of this e-skin-mediated soft robotic assembly include coadaptive movement that helps the robot pass through and/or operate in highly confined spaces, whose cross section is even smaller than the robot size. Furthermore, the proposed e-skin pair and corresponding wireless inter-skin communication concept can wirelessly activate multiple types of soft robots through reversible assembly of the e-skins. The researchers write, "Soft robots have great advantages in organically integrating every robot components without rigid boundaries, but current soft robotic designs still rely on rigid components mostly in driving parts. This e-skin opens a new avenue for soft robotic assembly. It is soft, thin, and light enough for a robot not to be perceptible, but it can activate the robot as a driving skin." The research will be published in the 18th issue of Science Robotics on May 30, 2018.